Mardi Gras, the world-renowned festival with a reputation for being the most scandalous and sensational annual event on the world's festival calendar, has been celebrated in New Orleans in its present form since 1856. The origins of the carnival trace back to Roman times, but the date is based on the Christian calendar. Traditionally, Mardi Gras day falls on 'Fat Tuesday', the day before Ash Wednesday, usually occurring during late February or early March each year. The history and traditions of the New Orleans Mardi Gras are confusing and complicated. 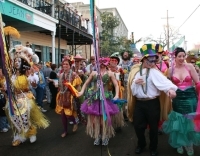 But what it all means to revelling visitors is a series of ever-more exciting spectacular street parades through the French Quarter, starting about 10 days before Fat Tuesday and building up to the big day culminating in a major street party.